Denver, Colorado is a booming travel destination thanks in part to its craft beer presence, professional sports teams and incredible variety of outdoor activities and adventures. Whether you are looking to catch a Rockies game, hit a brewery tour, or battle the rapids in Colorado’s infamous whitewater, you are sure to have the time of your life in Denver. Ziplining in Denver is a great way to get outside and experience Colorado and everything it has to offer. If you’re on the hunt for an aerial tour in the area, check out the following best Denver zipline tours for your Rocky Mountain adventure. There are a number of ziplining tours near Denver, however, none are located in the city limits. The true wild west starts just outside of Denver, offering incredible Rocky Mountain views that you can’t find in Denver. 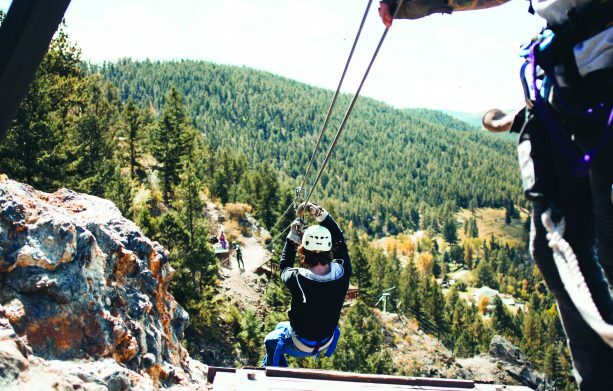 The closest zipline to Denver is located just 30 minutes from Denver in the historic town of Idaho Springs. 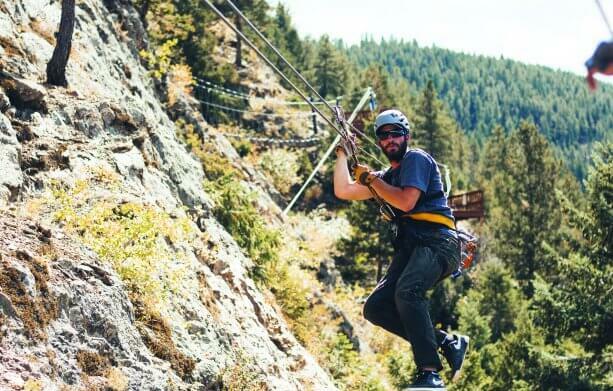 This Denver zipline course takes you high above Idaho Springs across the towering cliffs and through the trees. 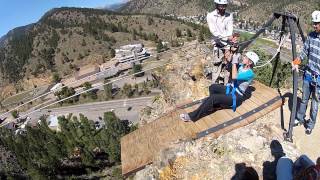 You can find this thrilling zipline adventure at Colorado Zipline’s Cliffside Zipline. The next closest zipline to Denver is located about 45 minutes southwest in the town of Conifer. This zipline is operated by Denver Adventures and offers a variety of trip lengths. 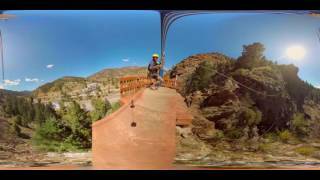 You can find the Castle Rock Zipline about an hour south of Denver about halfway to Colorado Springs. This adventure offers different trip packages for your desired adventure level. You can zipline year-round in Denver, however, some might suggest spring and fall as the best times to go. Not only will you get to experience the changing seasons, you’ll beat the crowds and the heat of summer, and avoid the low temperatures of winter. Spring ziplining offers you the incredible views of snow capped peaks and comfortable temperatures. If you are looking for a unique leaf-peeping experience, fall ziplining can provide you with breathtaking views of the changing leaves of the Colorado Rocky Mountains. You may even get lucky and get to see how the fall leaves and start of the snowfall combine for the best view of the Rockies. Summer ziplining in Denver is a great way to get a bird’s eye view of the mountains. Colorado is known as the state with 300 days of sunshine. Soak it up on a summer zipline tour! Summer in Colorado is known for it’s short and sweet afternoon showers, so either try an early bird zipline trip, make the most out of happy hour with an evening or starlight zip trip, or prepare for a little rainstorm during your early afternoon trip. There are a few options when it comes to ziplining in the winter. If you decide to take a high-flying adventure sometime between December and March, make sure you are completely prepared for whatever turn the weather may take. You will want to be outfitted in layers, thick and sturdy shoes and more. Check out more about winter ziplining here. Whether you choose Idaho Springs, Conifer or Castle Rock, chances are you are going to encounter some traffic if you aren’t careful. I-25, I-285 and I-70 all experience the occasional backups from Denver, but if you plan ahead you can avoid these as much as possible. If you would like to avoid the summertime traffic, keep in mind that Colorado does most of its roadway construction during the summer. The best way to avoid delays is to head out early or late. You may not be able to avoid the construction, but you can avoid the masses by planning to drive before and after the busy periods. If you are hoping to avoid the slowdowns of winter traffic, try to travel outside of the weekends. Between Friday and Sunday, Denver experiences a mass exodus during the winter of people seeking fresh powder on the slopes of Colorado’s ski resorts. By planning around the weekend, you can avoid the backups as much as possible. Spring and fall tend to be the slower periods for Colorado’s roadways, however, these “in-between-seasons” seasons are growing in popularity as travelers are catching on to what Colorado has to offer in the spring and fall. While the traffic during the spring and fall is much more manageable than summer and winter, you may want to peak at the CDOT Travel Info to check on any delays before you hop in the car. The best zipline in Denver is all going to depend on who you ask. For instance, if you ask us, we are going to say our Cliffside Zipline is the best Denver zipline. After all, it was voted the Best Zipline in the Rocky Mountains by Elevation Outdoors Magazine. If you’d like a more objective opinion, we suggest checking out the reviews of Denver zipline adventures on TripAdvisor, Yelp and Google. Located just about 30 minutes from downtown Denver, AVA Colorado Zipline’s Idaho Springs course was voted the Best of the Rockies in 2016 by Elevation Outdoors. Featuring six different zip lines, a 50-foot free fall, a surf zip and many more exciting features, this Denver zipline is not your average zipline adventure. The variety of high-speed zip lines and unique elements make this Denver zip line course one of the best in the entire state! If you are ages 7 and up or at least 50 lbs., head to this Colorado zipline for the adventure of a lifetime. This course is open from March – November, giving you plenty of time each year to enjoy this Denver aerial tour! Trips are about 3 hours long and about $79-$89 for kids and $99-$109 for adults, and there is even an option for Full Moon and Starlight Zip tours! Book your trip online or by calling 855-947-7464. The Castle Rock Zip Line is a 10-line course that spans over 1.5 mines of zipping! You can reach speeds of up to 50 mph on some of the fastest and longest lines in Colorado. This course, just like AVA’s Cliffside Zipline, also features a dual race line at the end of the course! You can also check out the Epic Adventure Tower, which includes a 42-foot climbing wall, rappelling, jumping stations and a 75-foot platform with the World’s highest flight line. Zipline tours are $89 per person, and the adventure tower is $69 per person. Visit their website to book, or call 720-733-9477. Located about 45 minutes from downtown Denver, Denver Zipline Tours offers various tour lengths, from 4-line for $79.99 a person to 8-line for $119.99 a person. This course is nestled in the Rocky Mountains just outside of Denver and operates year-round (limited trip times from November – March). Kids ages 5 and up can join in on the fun of ziplining in Conifer. You will be between 30 feet and 250 feet above the ground throughout this course. Keep in mind there is a short, scenic uphill hike to get to the start of the zipline. You can also take advantage of sunset trips with Denver Zipline Tours! Check out their website or book your tour by calling 303-984-6151. Denver is a great destination for those looking for a variety of activity year-round. Known for over 300 days of sunshine a year, you’ll get to enjoy bluebird skies and plenty of outdoor adventure every season while in Denver. Whitewater rafting, horseback riding, fly fishing, golfing, and rock climbing take precedence in the summer, while the state turns into a hub for some of the best ski destinations in America over the winter. With Denver being at a perfect central location and the mountains only a short drive west from downtown, you won’t have to travel far to find adventure. If you’re looking for an afternoon adventure into the Rockies, look no further than our Cliffside Zipline tour. Idaho Springs is just half an hour west of downtown Denver on I-70, meaning you could be enjoying an exhilarating aerial activity in no time. If you’re looking to pair your ziplining adventure with some craft refreshments, Tommyknocker Brewery & Pub is just half a mile away from our Idaho Springs outpost, making this a perfect spot to head to after you soar along the cliffside. A cold beverage is the perfect finale to ziplining among the mountaintops in Colorado. What better of a combination than spending your morning battling Colorado’s whitewater and enjoying your afternoon flying through the treetops on a zipline? This classic duo will keep your heart racing all day, and AVA has constructed a handful of adventure packages to suit every group. If you’re looking for a day in the mountains with your family, our Gold Rush + Cliffside Zipline package allows kids as young as 7 years old to partake. You’ll start on the Cliffside Zipline tour. This 6-line course also incorporates multiple suspended bridges and even a Dual Race zip for the perfect sibling rivalry. Your afternoon will consist of navigating Class III rapids on the Gold Rush section of Clear Creek and gazing at the scenic gorge the rapids run through. Looking for something a little more challenging? Both the Upper Clear Creek + Zip and Lower Canyon + Zip packages have an minimum participant age of 15 years old. Both will send you soaring up to 30 mph among the treetops on our Cliffside Zipline in the morning and running Class III-V rapids come afternoon. These packages will give you the most bang for your buck and provide you with a day of adventure that will keep you reminiscing for months to come. More of a fan of spirits? Indulge in an aerial tour just outside of Denver, followed by some five-star liquor. Bouck Brothers Distillery in Idaho Springs is known for their superb whiskey and would make the best stop for you and your crew after you take on our Cliffside Zipline. Grab a much-needed refreshment after you experience the breathtaking views of the Continental Divide on our zipline tour with Bouck Brothers whiskey flights and tours. They’re open from noon to early evening on Fridays, Saturdays, Sundays, and Mondays, making this the perfect stop after a morning zooming along the cliffside.